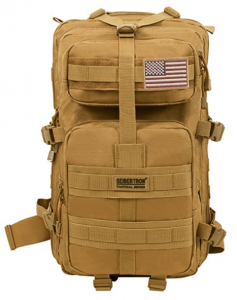 The Best Tactical Backpack of 2019 Reviewed - SolidGear Approved! So, you are searching for the best tactical backpacks of 2019? 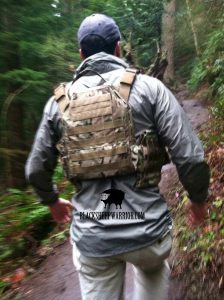 Tactical backpacks are a must-have for people working on law enforced areas, search and rescue missions or any other hobby out there where you can’t afford to be slowed down with multiple bags. What really makes these bags the best in the market is their sleek design and waterproof fabrics which are designed to withstand the most tough and difficult conditions while still being comfortable that you’ll hardly notice you’re wearing them. These bags are mostly designed to carry your stuff when traveling and are not bulky (usually weighs between 0.95-2.2 pounds). They use zippers and usually use snaps and buckles to keep them compact to your body. The best tactical backpack comes with additional pockets to store water bottles, goggles, documents, pens, and pencils. This section will look at four of the best day hike backpacks as well as reveal some of the best tactical backpacks from Amazon. Made of polyester fabric, the Red rock backpack is an imported tactical go bag with adjustable straps and Molle nettings. This tactical daypack features two front utility pockets, a master compartment, mesh pads which are hydration compatible as well as waist and shoulder straps to increase compatibility round your body. 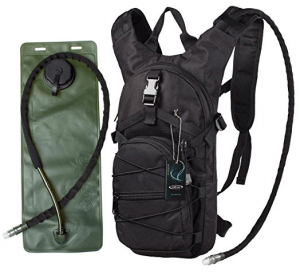 This tactical backpack has a weight of 2.5 pounds and dimensions of 9.5×18×12.5 inches. The Red Rock Outdoor Gear Assault Pack has been designed with a strong fabric that gives you the flexibility of carrying it on the handle or your back. It has a holding capacity of 2 liters giving you vast space to store all your accessories. The fabric is tough and able to withstand rough environments and settings without leaking water or tearing away. The back cushioning is net aired and able to keep your back comfortable when hiking. The bag is not ideal for carrying heavy equipment. It’s not waterproof but water resistant. The Seibertron Falcon Hiking Backpack is among the best day packs for hiking. It comes with a small design and light weight of 2.2 pounds which makes it ideal for hiking and camping activities. It features two medium and small compartments for storing your accessories such as clothes, a laptop, and a few other personal assets. It’s available in two sizes which include 37L (with dimensions of 19×11×11) and 27L (with dimensions of 16.5×9×11 inches). We’ve praised its large compartments because it’s able to accommodate most of your personal items while still maintaining its waterproof abilities. The Seibertron Falcon Hiking Backpack is very cheap ($40) and comes with lots of great features, unlike most pricey alternatives. The inside is roomy enough to hold most of your stuff when hiking for a day or two. The adjustable straps and buckles make this bag easy to travel with even when it’s fully packed. The water-proof 900D fabric is very durable and the best for outdoor backpacks. The shoulder strap lacks a stopper. This setback prevents the bag from staying tightly on your back for long hours since the strap comes out of the tensioner when the bag swings. Another setback with this backpack is that the waist strap doesn’t fit on wider people. This black tactical backpack has a large storage capacity of 15L with dimensions of 8.3×4.7×19.7 inches and a light weight of 1.9 pounds. The G4Free Hydration Backpack is not only meant for hunting, biking or camping. Its stylish design makes it ideal for hiking through hot days. The 3.0L water bladder helps you eliminate the need to have water bottles on hand. Apart from the two major compartments, there are additional storage pockets which users can keep their phones, car keys, wallets, and other small tools. The outer compartment can stretch enough to keep more accessories such as a few shirts or a towel. The price of this backpack is pocket-friendly and highly affordable to most people. The Camden Gear Hydration Backpack is the best black tactical backpack which perfectly fits your back without allowing any swinging whatsoever. Adjustable shoulder, chest and waist straps which are dynamic and ideal for kids/teens and adults with 27”-50” waist sizes. The internal dimensions are roomy enough to hold all your personal accessories such as a few clothes, an iPhone, an 11”-12” laptop and a camera. The main compartment is covered with Rip Stop Nylon which is lightweight and water resistant. The replaceable 50 oz bladder has the ability to hold 1.5L of water enough to keep you hydrated throughout the day. This small tactical backpack has a light weight of 0.95 pounds and dimensions of 2.8×10.3×15.9 inches. 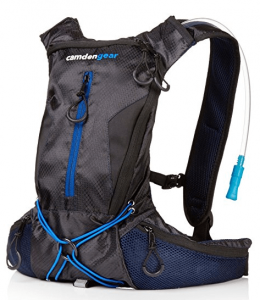 The Camden Gear Hydration Backpack has adjustable shoulder, chest and waist straps which help the backpack to stay compact on your back. Most people who run the Spartan and Gladiator races have praised the fabric stating that it’s friendly on your skin since they mostly run shirtless. The side pockets are designed at a strategic spot where you can easily access your phone, gel, wallet or car key. Since the straps perfectly fit your body, they usually leave excess strap materials flapping all over when running. You can shorten them yourself. While there are many types of tactical backpacks available in the market, you are required to first research on the best tactical backpack reviews to get the right information. This article has reviewed some of the best backpacks for hiking, camping or biking. After reviewing all the four tactical backpacks, the Seibertron Falcon Hiking Backpack and the G4Free Hydration Backpack are the best in the category. Although they’re available at a much higher price as compared to their competitors, they are water-proof, compact and come with large storage compartments which give you enough room to store all your personal assets without any problem. What really makes tactical backpacks the best over normal bags is that their compact design allows you to efficiently organize and compartmentalize all your personal accessories without wasting any time. They also come with dedicated spaces where you can store additional items such as pencils, pens water bottles, sunglasses or goggles. While these backpacks are designed to provide comprehensive storage to any environment or setting, they have been categorized into different series according to the tasks they’re intended to do. The MultiCam RUSH and the MOAB series are best for operators in the field while the customizable MOLLE series are the best for recreational users. Tactical daypacks with front loaders are easy to access, sleek and lightweight. These tactical backpacks come with multiple compartments where you can store your laptop and other gears in separate pockets. They help you stay organized and give you a hassle-free experience when searching for items through the pockets. On the other hand, top loaders are smaller, sleek and lighter as compared to the front loaders since they don’t come with multiple compartments and pockets. These tactical backpacks have fewer buckles, straps, and fabrics. Users who are keen on capacity should consider this type of bags since they’re flexible and able to carry more accessories and gears without a hassle. The normal bag capacity for the best daypack for hiking is around 30 liters. This volume is enough for a tactical daypack gear since it’s able to carry all your personal accessories with ease. If you need a bigger bag which is able to carry additional accessories, then you should opt for the 40-liter capacity bag. If you need something more, then the multi-daypacks or the outdoor military tactical backpacks will be the best for you. 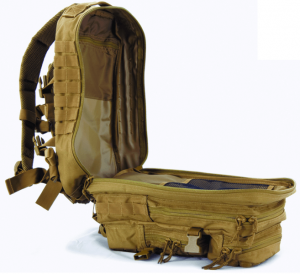 The fabric used to make your tactical go bag will affect its durability and performance. It’s important to check for fabrics that are lightweight, waterproof and fade-proof to achieve more high-end results. Some of the best fabrics to consider include; Nylon, Rip-Stop Nylon, Cordura Nylon, and Canvas. Note that: if your day hike backpack starts to wear off, use a patch to stop the hole from growing. If you want to learn how to patch a hole in your backpack follow this guide.